Home > Used Vehicles > 2019 Subaru Impreza 5-dr Touring AT,AWD,AIR,TILT,CRUISE,PW,PL, HEATED SEATS, BACK UP CAMERA, BLUETOOTH!!!! 2019 Subaru Impreza 5-dr Touring AT,AWD,AIR,TILT,CRUISE,PW,PL, HEATED SEATS, BACK UP CAMERA, BLUETOOTH!!!! Low Mileage, Heated Seats, Rear View Camera, STARLINK, Keyless Entry, SiriusXM! This 2019 Subaru Impreza is for sale today in Edmonton. Subaru drivers a distinct breed of people. The 2019 Subaru Impreza is a tribute to you. With a unique blend of style, versatility, capability, and technology that goes afar and above the competition, you'll be driving a car that defines your space in a world of sameness. 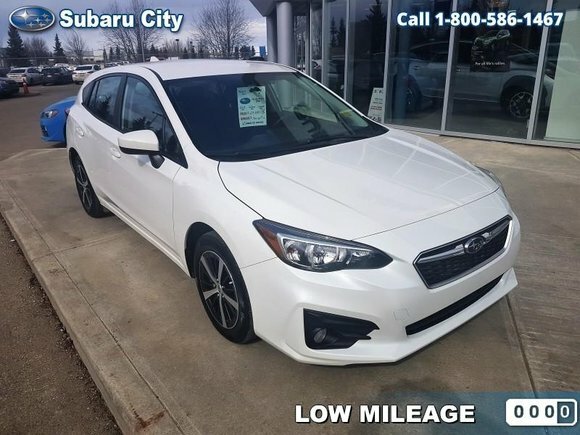 Make the most of every day with this 2019 Subaru Impreza.This low mileage wagon has just 7098 kms. It's crystal white pearl in colour. It has an automatic transmission and is powered by a 2.0L H4 16V GDI DOHC engine. This vehicle has been upgraded with the following features: Heated Seats, Rear View Camera, Starlink, Keyless Entry, Siriusxm, Steering Wheel Audio Control, All Wheel Drive.